the following post first appeared on the blog of Antietam Battlefield Guide Jim Rosebrock (South From the North Woods) on Aug. 7, 2012. 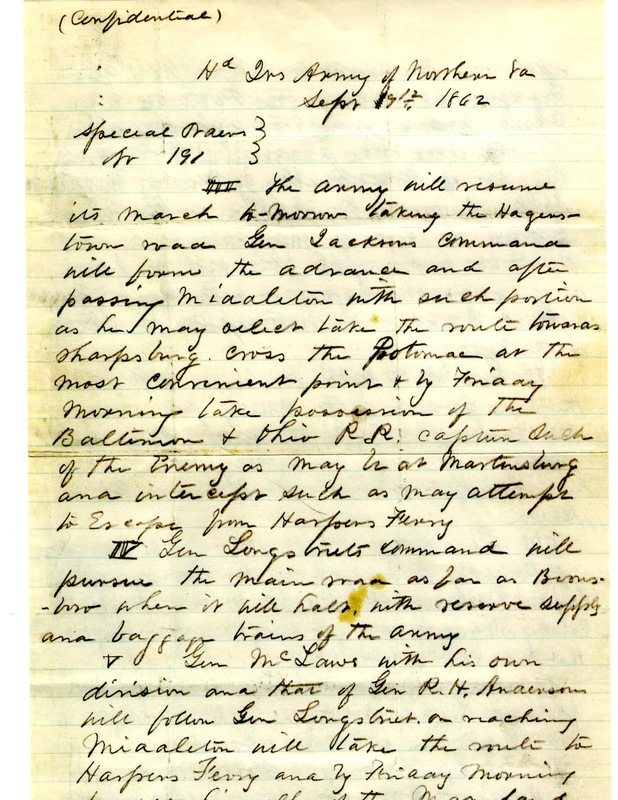 The copy of Special Order 191 that was found by Sergeant John Bloss and Corporal Barton Mitchell and put into the hands of General McClellan is now on display at Monocacy National Battlefield in Frederick. I was privileged to attend the ribbon-cutting ceremony for the new exhibit on Friday. On hand beside the bevy of V.I.P.s were descendents of the Bloss and Mitchell families. They contributed a number of previously unseen letters and artifacts to the exhibit. It was exciting for me to see such an important part of history and something so key to the Maryland Campaign. We owe a debt of thanks to everyone who made the exhibition possible. On Sunday when I was working at the Antietam Visitor’s Center, a sharp-eyed visitor asked why the copy of the Lost Order on display begins with paragraph III. Look closely at the order here. Was that a typo? Where are the “lost” paragraphs? I. 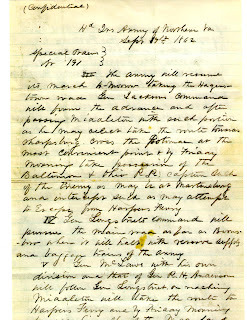 The citizens of Fredericktown being unwilling while overrun by members of this army, to open their stores, to give them confidence, and to secure to officers and men purchasing supplies for benefit of this command, all officers and men of this army are strictly prohibited from visiting Fredericktown except on business, in which cases they will bear evidence of this in writing from division commanders. The provost marshal in Fredericktown will see that his guard rigidly enforces this order. II. Major Taylor will proceed to Leesburg, Virginia and arrange for transportation of the sick and those unable to walk to Winchester, securing the transportation of the country for this purpose. The route between this and Culpepper Court-House east of the mountains being unsafe, will no longer be travelled. Those on the way to this army already across the river will move up promptly; all others will proceed to Winchester collectively and under command of officers, at which point, being the general depot of this army, its movements will be known and instructions given by commanding officer regulating further movements. Even though those paragraphs are administrative they are still interesting as they show the day to day operation and concerns of the army. I think that type of background information helps one understand the logistics involved in moving and supplying a mass of people that form an army.